For an effective treatment for psoriasis HUMIRA is proving to be a clear winner. Patients with plaque psoriasis that is stubbornly resisting other treatments, HUMIRA, a systemic therapy that works from the inside out, may be the direction you and your doctor decide is the right course of action. While results do vary, in clinical trials most participants after taking HUMIRA for four months saw a 75% to 90% improvement in their skin. So that’s the good news, what’s the bad news? Infections – HUMIRA blocks TNF an important factor in helping the immune system fight infections. With this in mind, before taking HUMIRA make sure you inform your doctor of ANY infections, viral, bacterial, or fungal, that you may have. Taking HUMIRA while you have an infection or if you get an infection while taking HUMIRA can, and has been, deadly, as even seemingly harmless infections can spread throughout the body. Cancer – Both adults and children taking HUMIRA have an increased chance of getting the “Big C”. Deaths have occurred when some using HUMIRA have developed heptatosplenic T-cell lymphoma. There is also an increased chance of developing basal cell and squamous cell types of skin cancer. While these are not usually life-threatening, be sure and inform your doctor if you have a skin sore or lump that doesn’t heal or go away. Live in an area where certain fungal infections are more common (the Mississippi and Ohio River valleys). Such infections include blastomycosis, coccidioidomycosis, and histoplasmosis. If you took HUMIRA during your pregnancy, make sure to inform your baby’s pediatrician BEFORE any vaccines are administered. Learn more about Important Safety Information. Serious viral, fungal or bacterial infection, including TB. Signs that you might have TB include: low-grade fever, weight loss, cough, body fat loss and muscle loss. Allergic reactions, including hives, anaphylaxis, trouble breathing, swelling of the face, lips, mouths or eyes. Nervous system issues, such as tingling or numbness, vision problem, limb weakness or dizziness. Blood problems, including paleness, bruising or bleeding easily, or a fever that doesn’t go away. Congestive heart failure, whether newly onset or worsening, indicated by shortness of breath, sudden weight gain, or edema. Lupus-like symptoms: chest pain, difficulty breathing, joint pain, cheek or arm rash that worsens in the sun. Liver problems indicated by extreme tiredness, jaundiced eyes, poor appetite or vomiting, pain on the right side of the abdomen. 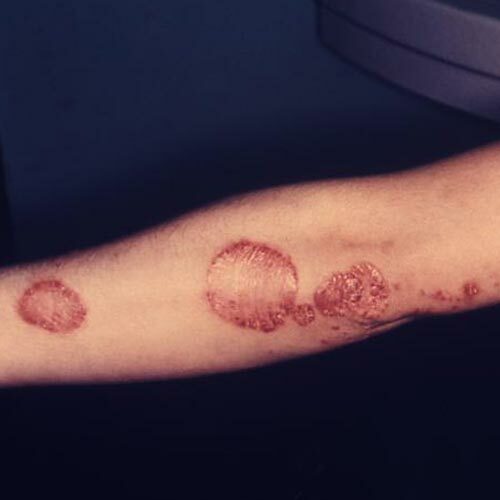 In addition to psoriasis HUMIRA is also used to treat polyarticular juvenile idiopathic arthritis, moderate to several rheumatoid arthritis, psoriatic arthritis, Crohn’s disease, ankylosing spondylitis and hidradenitis suppurativa.